The people living in the houses in these slums are Thankful for the roof over their heads. If you look closely at the top of the photograph, you will find that the roof is used to dry their clothes too! Talk about space shortage! A clear blue Mumbai sky as on 21Feb09 at 1624hrs. At the left bottom is the tip of the clock tower of the Crawford market. Typical Indian Jewelry. 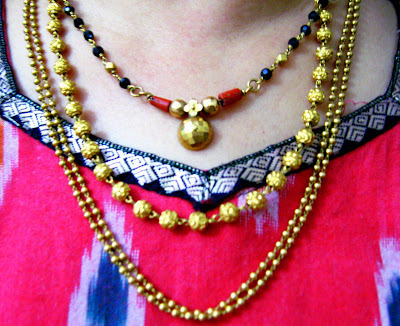 The necklace with the black beads is clled 'Mangalsutra' and is the traditional symbol of marriage for the Hindu woman. Crawford Market (officially Mahatma Jyotirao Phule Market) is one of South Mumbai's most famous markets. It is named after Arthur Crawford, the first Municipal Commissioner of the city. The market is situated opposite the Mumbai Police headquarters, just north of Victoria Terminus railway station and west of the J.J.flyover at a busy intersection. The market houses a wholesale fruit, vegetable and poultry market. One end of the market is a pet store. Most of the sellers inside the market nowadays sell imported items such as foods, cosmetics, household and gift items. It was the main wholesale market for fruits in Mumbai until March 1996, when the wholesale traders were relocated to Navi Mumbai (New Bombay). The building, completed in 1869, was donated to the city by Cowasji Jehangir. After India's independence, the market was renamed after Maharashtrian social reformer, Mahatma Jyotirao Phule. In 1882, the building was the first in India to be lit up by electricity. The edifice is a blend of Norman and Gothic architectural styles. The friezes on the outside entrance depicting Indian farmers, and the stone fountains inside, were designed by Lockwood Kipling, father of novelist Rudyard Kipling. The market covers an area of 22,471 sq m (24,000 sq ft) which 5,515 sq m (6,000 sq ft) is occupied by the building itself. The structure was built using coarse buff coloured Kurla stone, with redstone from Bassein. It has a 15 m high skylight awning designed to allow the sunlight light up the marketplace. This is 'Princess Street' - the gateway to 'olde Mumbai' in the Southern part of Mumbai. Bozo is our pet. 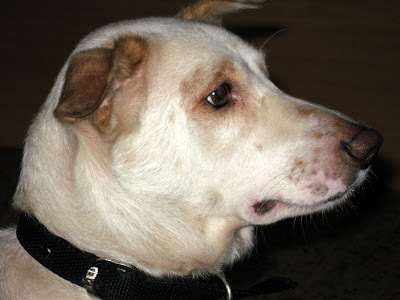 We had adopted him from the streets of Mumbai when he was 2 months old. Now he is 5 and a half. He has brought a lot of joy for us and continues to do so. Mumbai skies as on 29Jan09 at 1804hrs. Pink skies of Mumbai as on 30Jan09 at 1836hrs. ABC Wednesday - E for Egging on..
Enthusiasts Egging on the athletes at the Mumbai Marathon 2009. Mumbai on 09Feb09 at 0601hrs. 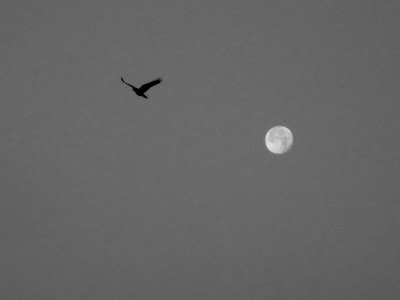 Moon at dawn in Mumbai on 11Feb09 at 0716hrs. Camera Critters - 2 is company..
Off the Mumbai coast at Bandra, fishing boats on their nautical journey. The Mumbai sky as seen on 30Jan09 at 1818hrs. Dusk in Mumbai on 29Jan09 at 1842hrs. An overview of a slum corridor. Camera Critters - The Scavenger! Hey! You lookin' at me?! The bridge that connects Bandra and Worli in Mumbai. This photo was taken on 12Dec08 and the bridge is scheduled to open on 01May09. 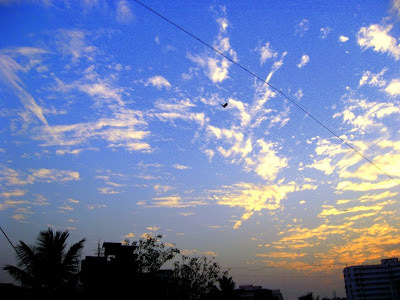 The Mumbai sky on 29Jan09 at 1821hrs. Am running in the marathon now. Can we discuss this later? The sky in part of the world as seen in Mumbai on 29Jan09 at 1840hrs. The moon escorting Venus on a dark night - 30Jan09 at 1922hrs.